for a violin/viola that can go into your suitcase or backpack? hotel room or your apartment late at night and still keep the peace. or cannot take your good instrument. three minutes. It gets held and played just like an ordinary instrument. The tone is pleasant and quite audible, but much more quiet than that of a regular violin. 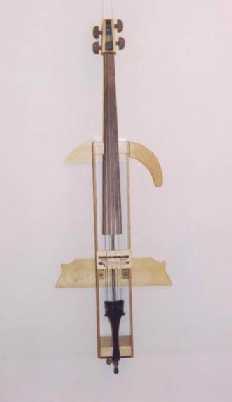 The practice violin's body is made of wood (mostly spruce). Neck, pegs, fingerboard, bridge, and tailpiece are all standard. High-quality steel strings and an over-the tailpiece chin rest are furnished. Any of the usual shoulder rests may be used. The disassembled parts are shown here. Strings remain fastened to the pegs and tailpiece to save time when the instrument is put together the next time. The assembled violin can, of course, be carried in a normal case. It is shipped (disassembled) in a sturdy cardboard box. * We can furnish a take-apart bow -- it comes in two pieces which fit together in a few seconds. (This is a fiberglass bow with horsehair). which is about 27 inches long. * You can take your regular bow in a bow case. NOTE: Production of practice/travel violins has temporary ceased. 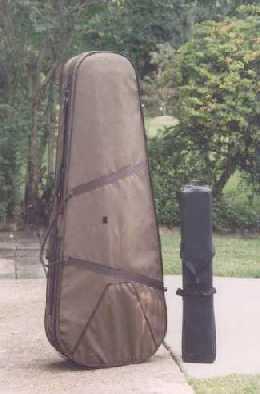 Cellos ( below) are still being made. playability, and ease of assembly." overnight case ... I found setting up the instrument very easy." if I get time to practice. And guess what I am packing in my suitcase..."
disturbance to others -- in a hotel room, in an apartment, in the office, or anywhere else. comes with high-quality steel strings. It has a tailpiece with four fine tuners as well as a standard bridge, end pin, and fingerboard. The finish is a mellow light-colored varnish. (14 x 17 x 76 cm). Instrument plus case weigh barely 8 lb (3.6 kg). remain attached at all times to the pegs and tailpiece. 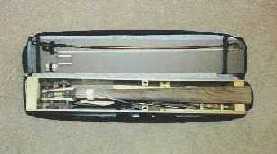 The endpin gets removed completely when disassembling the instrument, so that it can be placed in one's checked baggage if necessary for air travel security. Prakticello produces the full sound of a decent acoustic cello. Suitable transducers are carried by many music stores. even a piece of music and your music glasses. ular cello to suffer damage if checked into the hold. "My Prakticello arrived a couple of hours ago. Great instructions, easy to set up, everything fits well -- and it's much closer to playing a real cello than I had imagined. 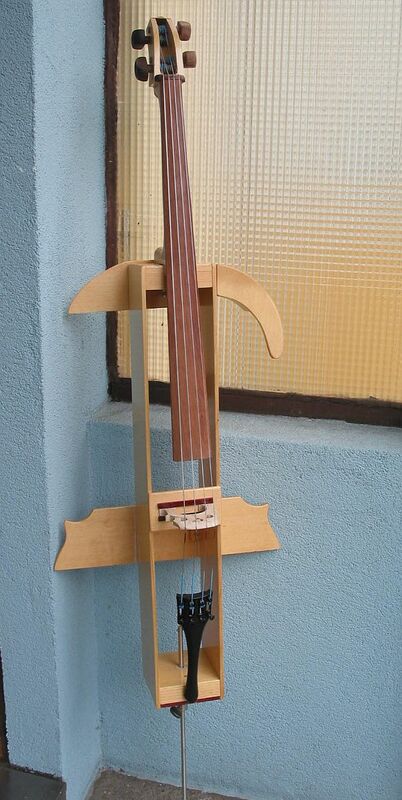 I like it a whole lot better than the Yamaha Silent Cello I've tried. I'm a very happy camper." "I just wanted to let you know how pleased I am with the Prakticello ... Your instructions were the best ... I just love the instrument, not only for its portability but also for the fact that it doesn't bother others when I play it." In July 2010 there appeared on National Public Radio's "All Things Considered" an interview with Ernest Nussbaum discussing the Prakticello. The interview can be seen/heard on the web site indicated below, which also includes excerpts of music played on the instrument.